This week’s blog entry was written by guest author Rene De los Santos. Rene is a graduate of Whole Life Yoga’s 200 hour yoga teacher training program, a student in our advanced training, and a teacher at Whole Life Yoga. He can be contacted at theyogirene@yahoo.com. You may be familiar with the phrase “think before you act” or the ever popular “what were you thinking?” I heard the latter quite often during my adolescent years, although I very seldom had a chance to respond while adults conversed loudly around me. We all know that our actions are conceived in thought, but luckily (or should I say thoughtfully) we don’t do everything we think because we (usually) think before we act. Here’s a proposition for you and one I have set for myself; breathe before you act. Working on pranayama assignments in the yoga teacher training over the last few weeks has made me think a lot about the breath and lengthening the breath; conscious breathing. A question that came up for me was “What is the point?” This question continued to plague me until it occurred to me that I was practicing without intention. I must confess now that this revelation did not drop on my head from heaven; it was a part of a discussion we had in the teacher training–my big AH HA moment of the evening. That’s what’s missing: intention! Here’s a thought: if we think before we act (theoretically changing the outcome) what will change if we take some time to breathe before we act? Not a long pranayama practice; just take a minute or two to notice your breath, notice the pauses and quality. Of course, a successful practice takes more than a couple of minutes, but what if we just noticed the breath throughout the day…and what would happen if we took a minute or two to just breathe before we acted? I remember being in a Q&A session with Desikachar several years ago and noted how he always takes a couple of deep breaths before answering a question. He was breathing before acting whereas I tend to say the first thing that pops into my head. How different would our day be if we could step outside every now and then, take a few deep breaths and let the sun shine on us for a minute or two? This entry was posted in Breath, Guest Writers, Teacher Training, Teacher Training Graduate Stories, Viniyoga, Yoga Books on May 26, 2014 by Tracy Weber. Hi all! 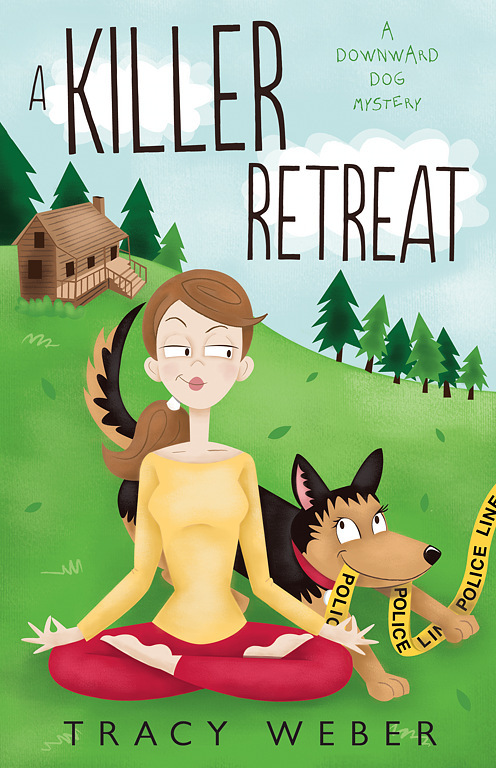 I’m absolutely delighted to announce the cover and publication date of my second Downward Dog Mystery, A KILLER RETREAT. The book is in the final stages of editing now, and my publisher has finalized the cover. Available January 8, 2015 from Midnight Ink! Leave a comment about the cover in the next week for a chance to win a Downward Dog Mysteries coffee mug! The book will be out January 8, 2015, but I’ll likely have copies again in late December. Why wait? Pre-order your personalized, autographed copy from Whole Life Yoga now, and I’ll mail you a signed bookmark as soon as they are available! When Kate gets an offer to trade teaching yoga for a weeklong stay at a newly reopened vegan retreat center, she jumps at the opportunity, even though it means being forced to endure the wedding ceremony of the center’s two caretakers. Avoiding the M-word turns out to be the least of Kate’s problems when a wedding guest is found floating face-down in the resort’s hot tub, shortly after a loud, public (and somewhat embarrassing) fight with Kate. The police pick Kate as their number-one suspect, so she’s forced to join forces with Michael, best friend Rene, and sidekick Bella to find the real killer. But they’ll have to solve the murder before the police arrest Kate, or her next gig may last a lifetime—behind bars. This entry was posted in dogs, Downward Dog Mysteries, writing, Yoga Books and tagged A Killer Retreat, Cozy, cozy mysteries, cozy mystery, dog, dog mystery, dogs, downward dog mysteries, downward dog mystery, German Shepherd, Murder Strikes a Pose, Orcas Island, Orcas Island mystery, Tracy Weber, viniyoga, writing, yoga, yoga mystery on May 17, 2014 by Tracy Weber. A note from Tracy: Publicists send me multiple blind submissions for blog articles every week, and for the most part, I review and ignore them. But this one caught my eye. Meditation and yoga helped me survive my last two years at Microsoft. You may not be able to make it to the studio every day, but you can practice mindfulness wherever you are–including at work! I hope you enjoy this article by Dr. Romie Mushtaq. Google, eBay, Intel and General Mills offer classes on it. So do Harvard Business School, Ross School of Business and Claremont Graduate University, among other campuses. Mindfulness is not just a corporate trend, but a proven method for success. How can people practice it in a workplace where multitasking is the norm, and concerns for future profits can add to workplace stress? 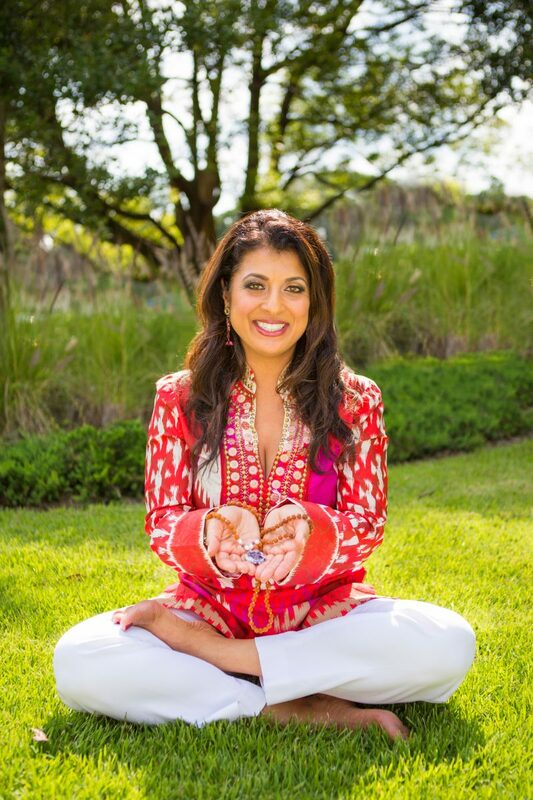 “Even if a company doesn’t make it part of the culture, employees and managers can substitute their multitasking habits with mindfulness in order to reduce stress and increase productivity,” says Dr. Romie Mushtaq, www.BrainBodyBeauty.com, a neurologist with expertise in Mind-Body medicine and Mindful Living. Dr. Romie says the physiological benefits of clearing away distractions and living in the moment have been documented in many scientific and medical studies. “Multitasking, on the other hand, depresses the brain’s memory and analytical functions, and it reduces blood flow to the part of the right temporal lobe, which contributes to our creative thinking. In today’s marketplace, creativity is key for innovation, sustainability and leadership. • Focus on a single task for an allotted amount of time. You might say, “For 15 minutes, I’m going to read through my emails, and then for one hour, I’m going to make my phone calls,” Dr. Romie says. • When you get “stuck” in a task, change your physical environment to stimulate your senses. Sometimes we bounce from one task to another because we just don’t have the words to begin writing that strategic plan, or we’re staring at a problem and have no ideas for solutions. • Delegate! We often have little control over the external stresses in our life, particularly on the job. How can you not multitask when five people want five different things from you at the same time? This will not only allow you to focus on the tasks that most need your attention, it will reduce your stress. While it is possible to practice mindfulness in a hectic workplace, Dr. Romie says she encourages business leaders to make it part of the company culture. Stress-related illnesses are the number one cause of missed employee workdays. Dr. Romie is a mind-body medicine physician and neurologist. She did her medical education and training at the Medical University of South Carolina, University of Pittsburgh Medical Center and University of Michigan, where she won numerous teaching and research awards. She brings to healing both her expertise of traditional Western medical training and Eastern modalities of mindfulness. She is currently a corporate health consultant and professional health and wellness life coach at the Center for Natural and Integrative Medicine in Orlando, Florida. She is also an international professional speaker, addressing corporate audiences, health and wellness conferences and non-profit organizations. Her website is www.BrainBodyBeauty.com. This entry was posted in Guest Writers, Meditation, Yoga Research and tagged meditation, mindfulness, mindfulness at work, yoga on May 12, 2014 by Tracy Weber. Allow your eyes to close, or if this is too challenging, keep your eyes at “half mast” gazing softly down and several inches in front of you. Notice your breath, without intentionally trying to change it. First notice the warmth and coolness of the breath at the tip of your nostrils. Then notice the movement of your rib cage and belly. How does your spine move with each breath? What other sensations can you feel? After two to three minutes, imagine that there is a sphere of golden butter on the crown of your head that is being warmed by the sun. As the butter slowly melts, it oozes warmth and peace down your body. Any place that it touches your body, stress melts away. Imagine the response of every muscle to the warm liquid. As the butter flows over your forehead, feel wrinkles ease away from your brow. Imagine it running over your cheeks, relaxing the small muscles at the edge of your jaw. As it moves down to your neck and shoulders, feel any tension you might habitually hold in those areas release. Feel the warmth move down your chest, your belly, down your arms, hands and out through your fingertips. Feel it move in small rivulets down your spine, relaxing the tiny muscles that connect each vertebra. Continue exploring the sensation of the warm, oily liquid as it moves down your body, down your thighs, calves, ankles, feet and toes. After the first pass, notice any areas of remaining tension and bring your awareness to those areas again. Imagine warmth and softness erasing all places of tightness. If your attention wanders (and it will!) just notice it, and invite your focus back to the sensation of the breath at the tip of your nose. Then begin to imagine the nurturing, warm buttery sensation again. Enjoy. May you find peace and vibrant good health! This entry was posted in Meditation on May 5, 2014 by Tracy Weber.